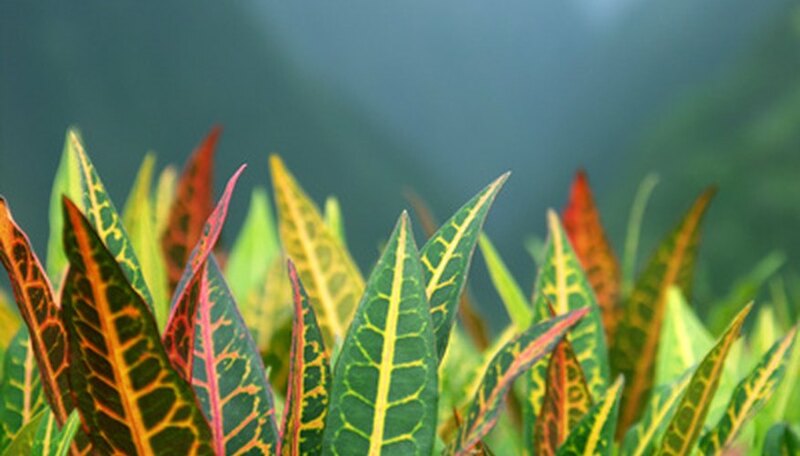 One of the tropic's most colorful shrubs, the croton (Codiaeum spp.) does not tolerate frosts and freezes. The variety Petra boasts large oval leaves that are variegated with colors of deep green, yellow, red and orange. Whether in a tropical garden or as a house plant potted specimen, the Petra croton adds visual excitement wherever it grows. Crotons today are the result of years of hybridization and selection by modern gardeners and Pacific Islanders alike. Botanically known as Codieaum variegatum, it is synonymous with and sometimes listed as Codiaeum variegatum var. pictum. It is a member of the spurge family, Euphorbiaceae and is a flowering plant, or angiosperm. The botanical genus or group Codiaeum comprises about 15 species of tropical shrubs or small trees native to Southeast Asia and the islands of the Southwest Pacific. Since people in their native region have bred and selected crotons for generations, modern varieties like 'Petra' are believed to be derived from a cultigen, or plant form that not existing in nature, but the result of man's genetic manipulation. The Petra croton will reach a mature height of 8 to 10 feet and spread of 4 to 6 feet, attaining an upright, but irregularly rounded shape. Its large oval evergreen leaves are waxy and stiff but still flexible. The leaves are variegated, usually being one solid color with lighter colored veins. Often new leaves emerge yellow and green and as they mature and are exposed to sunlight and different temperatures, blush to tones of red, burgundy, orange, salmon and peach-pink. Its bark is tan and smooth and the plant exudes a milky sap from broken leaves and stems. Overpowered by the vibrant, colorful foliage, the Petra croton does not receive attention if and when it flowers. In the warmth of summer, stem tips will bear a long, snake-like and drooping spikes of small flowers that are creamy white. Most modern varieties of croton are sterile, meaning their flowers will not form fruits and seeds. The Petra croton may be grown outdoors year round in the tropical regions with USDA Hardiness Zone rating of 10 and warmer. This tender shrub will tolerate light frosts, perhaps losing a few leaves with the chill, but will defoliate if temperatures drop below 30 to 32 degree F. Prolonged subfreezing temperatures will kill the plant entirely, freezing the sap and even killing the roots in the soil. In regions where the Petra croton is not hardy outdoors, grow it as a house plant. Plant Petra in an acidic, moist, but well-draining soil that is rich in organic matter. A sandy or loam soil with peat or compost is ideal. In high latitudes the croton can tolerate full sun, direct sun rays over eight hours each day. In the tropical landscape, it is best to give Petra partial sun or partial shade to prevent the hot summer sun from scalding or bleaching the colorful foliage. Shade in the midday is beneficial, but too little sun at other times of day can diminish the colors of red, burgundy and orange on Petra's leaves.